The OPC version can operate as either an OPC client or as an OPC client/server. Where the DCS or SCADA system provides both OPC client and server interfaces, ProLoop would act as an OPC server. Some older Distributed Control Systems provide only OPC server functionality. In this case ProLoop acts as an OPC client. ProLoop has also been implemented in the Honeywell Application Module (AM). The Integrated Error indicates how closely the process variable tracks the setpoint. 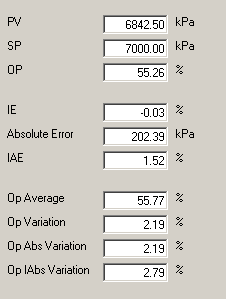 If the integrated error is close to zero, it indicates that the PV is, on average, close to the controller setpoint. Even though the integrated error (IE) may indicate that the average PV is close to setpoint, there may, however, be cyclic deviations around the mean. The Integrated Absolute Error indicates the extent to which the PV deviates from setpoint. This indicates the extent to which the controller is varying its output around the mean in an effort to keep the process variable at setpoint. This is an important parameter when considering valve wear. It may also indicate that the controller gain is set too high (in other words, the proportional band is too small) as it is too sensitive to changes in the PV. This is close to zero (-0.03%), and indicates that, on average, the loop is operating close to setpoint. The Integrated Error can, however, be misleading, as it can be seen that the PV is cycling around the setpoint. This is substantially greater than the Integrated Error, and indicates that the loop is deviating significantly from setpoint. The reason that IAE is so large compared with IE is that the PV is cycling around the setpoint. This indicates that the controller is moving the output significantly as it attempts to control to setpoint. ProLoop has also been implemented in the Honeywell Application Module (AM). The AM implementation uses custom data points, with one AM custom point processing a regulatory PID control point in the control device. 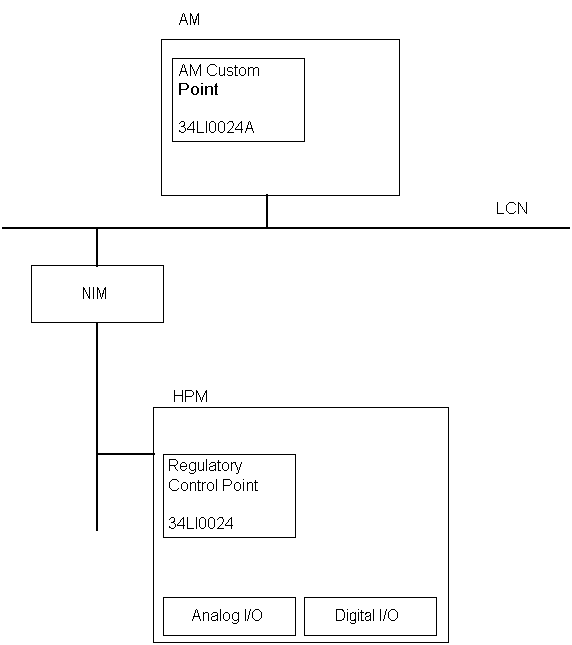 A HPM Regulatory Control point is shown here, but it could be a MFC or Extended Controller regulatory control point on a Data Hiway. One AM custom point is then built for each controller that is to be monitored. The code is generic, such that adding a new AM point only requires linking the CL object code, not a recompilation. parameter IE       : number             "Integrated Error"
parameter IAE      : number             "Integrated Absolute Error"
parameter OpAvg     : number             "Average Output"
parameter OpVarAvg  : number             "Average Output Variation"
parameter AlarmFlg : AmFlag             "Alarm Flag"
parameter IAETP     : number            "Integrated Abs Error Trip Point"
parameter OpVarTP   : number            "Output Variation Trip Point"
An alarm can be raised, via the point in the AlarmFlg parameter, if these calculated variables exceed the alarm trip point.